Here’s the easiest way how you can mirror your Android device to your PC or Mac and even control it without having to root. There are a few applications out there that let you mirror your Android device to your PC or Mac, and even control it right from the comfort of your keyboard or mouse. One such app is AirDroid, and is packed to the gills with a ton of great remote controlling features. Of course, to make full use of the app, you need to have a rooted device, and the process of rooting is not everyone’s avenue. 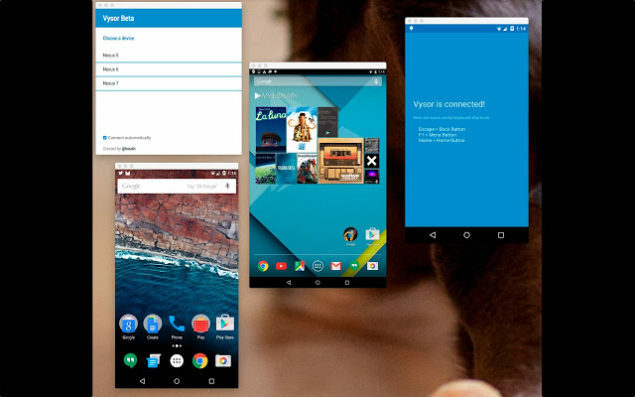 With that in mind, famed developer named Koush has released a brand new Chrome app called ‘Vysor,’ that lets you mirror and control your Android device right from your PC or Mac, and you don’t need to root your smartphone or tablet at all for it. No Fuss, No Rooting Required. Just Install And Start Using! In fact, the only thing you need to do is enable ‘Developer Mode’ and ‘USB Debugging.’ You can enable Developer Mode by going to Settings > About phone, and tap on the ‘Build’ number seven times till a prompt appears that you’re now a developer. Once enabled in Settings, simply enable ‘USB Debugging’ and you’re all set. Rest is the simple case of following instructions in the Vysor app for Chrome on how to set it up. And the cool thing is, Vysor isn’t limited to just your PC or Mac – with Vysor Share, you can even share your device’s display with someone else over the Internet. How cool is that? Check out the videos below and see Vysor and Vysor Share in action. The best part about Vysor is not probably its set of features, but instead, its price. And in case you’re wondering, Vysor is absolutely free to download and install, so you don’t have to worry about busting your bank to add extra functionality on top of your Android device. Keep one thing in mind though, Vysor comes attached with a beta tag, which means that it can be choppy at times and performance is not what you’d call ‘top notch.’ Keeping that in mind, the basic core functionality is all there, and you’ll get around Vysor in a matter of minutes, given you set up everything right in the first place. You can download Vysor from here. And since it’s free, we recommend that everyone give it a shot on their PC or Mac, provided you have an Android device lying around. After all, Vysor is an absolutely cool party trick to pull off in front of your social gathering. Tried Vysor? Then be sure to let us know about it in the comments section below.